I loved carnivals and fairs as a kid (still do!). My favorite stop was always skee ball on the carnival midway. You could roll a ball down the narrow lane into one of the waiting rings. You would get tickets based on how many points you made, and you could trade them in for a prize (usually a stuffed animal). Seeing this image reminds me of so many fun trips to the carnival, especially in summer time. Carnivals like this were always found by the beach on vacations. 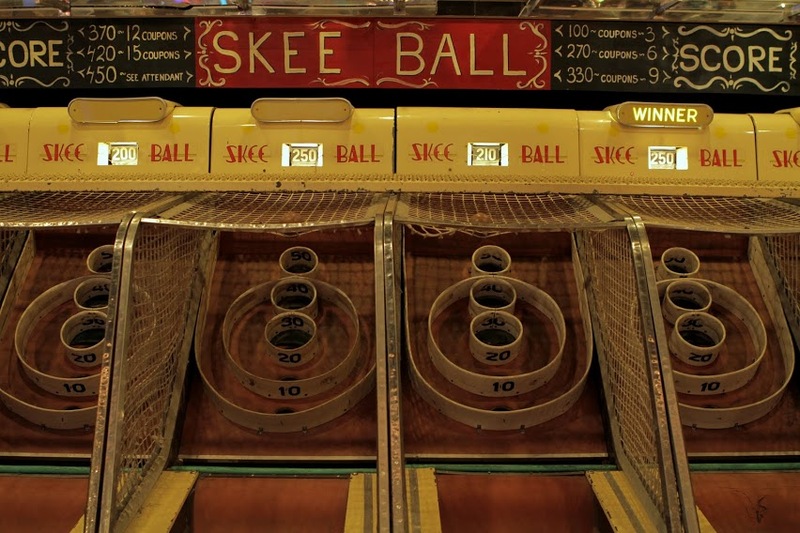 Do you remember skee ball? When was the last time you played? I would love to hear from you in the comments, below. 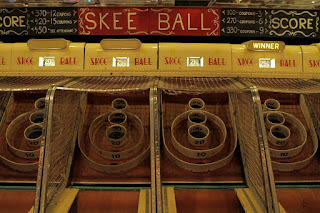 I LOVE SkeeBall, and fondly remember playing as a girl alongside my grandmother (another big skeeball fan!) when she took me to the beach (which she did quite often!). I played last year in an arcade on the boardwalk at Ocean City, MD when we spent our vacation there! I love SkeeBall too, as well as other carnival games. I believe I last played at a Mall in the game room, but can't remember how long ago that must have been. I especially enjoyed your interview with T.J. O'Connor. What an interesting guy! I love skee ball. Oh the memories of my youth. The only time I get to play now is when I go take the kids to Chucky Cheese. oh man, skee baaaall!This brings back such good memories of growing up in Texas. I used to love going to this local pizza joint, which still exists, because it is filled with arcade games, a jungle gym, and SKEE BALL! I haven't played in a long while, but it's on my summer list now! I love this game because it's the ONE TIME I am better than my husband at anything involving a ball. haha!